Last week I was in Stockholm, Sweden, where I was visiting Nordita, the Nordic Institute for Theoretical Physics, and gave a seminar on Phenomenological Quantum Gravity. Nordita is an interesting place. 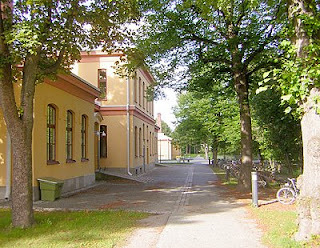 The building is located right next to the Department of Physics, at Stockholm University that I had visited before. Nordita was founded in 1957 in Copenhagen, Denmark, and was relocated to Stockholm in January 2007. Their building is shown in the photo above. If you have been there before, the entry to the AlbaNova University Center is to the left. You can find some more photos of the building here. Nordita's main mission is to strengthen the collaboration in theoretical physics between the five nordic countries Denmark, Finland, Iceland, Norway and Sweden. In their logo, shown to the left, each triangle stands for one of these countries. Nordita's research areas cover quite a quite diverse range of topics in theoretical physics: astrophysics and astrobiology, condensed matter, statistical and biological physics and high energy and nuclear physics. Compared to Perimeter Institute, it is a somewhat smaller institution. Though the faculty is of similar size, they have considerably fewer postdocs and students. Nordita further has a very active scientific program which brings together groups of leading experts to work on specific topics for extended periods, similarly eg to the programs at the KITP. If you have not visited Stockholm before, let me add it is on my list with the most beautiful cities I've been to (together with Cape Town, Vienna and San Francisco). I don't speak Swedish but it is remarkable that literally everybody in Stockholm seems to speak English (and isn't funny about using it either as eg the French are). If you know German and English you can guess a lot of Swedish words though. Altogether a very interesting and enjoyable stay. Minus the snow. Quick, don't think: What's typically American? Weekend quick poll: name five things you think are typical for the US of A. No names, no places. Will update the following list. Have a good start into the weekend, and our readers in Europe should not forget to spring forward on Sunday. PS: You don't have to come up with items that are not already on the list. I count how many times they were named, I just didn't want to use a standard poll because this way you can suggest items yourself. Meanwhile, the APS is conducting a survey How is the economic downturn affecting your organization?, that I encourage you to fill out if you are a physicist presently working in the USA. Despite this posted under Stefan's name, it's your all-time favourite Bee writing here, cursing her husband's German kezboard, if zou know what I mean. We are currently in Dresden for a meeting of the DGP (German Physical Society), and we are LATE, as Stefan keeps pointing out. Therefore I'll just wish you a good start into the week, more from the conference later. Every time I arrive at the airport in Frankfurt and go through passport control under the EU circle of stars it strikes me how GERMAN the border officials look. Maybe it's just that the uniforms are green instead of blue, or maybe it's because noticeably more of them are blond and blue-eyed than South-, East-, and Westward of here, but without that intimidating Viking chill you find further North. And if you arrive from North-America it's impossible not to notice how silent they are. They might just give my passport an uninterested look, hand it back, and nod over my shoulder to the next person. The guy on Wednesday was comparably chatty and mumbled “Schön Tach noch” (about: have a nice day). And as usual, Germany looks different from the inside than from the outside. The only thing I seem to read in newspapers and magazines overseas about Germany is the chancellor Angela Merkel's hesitation to throw more of taxpayer's money out of the window, which drowns these day in a vast sea of articles about layoffs, commentaries on The Great Recession, declines in consumer spending, rises in unemployment and other over-interpreted statistics. Browsing through a German newspaper however, reporting on the financial crisis remains in the business sector. Unlike six years ago, so far nobody of my friends or relatives has lost his job, and I haven't noticed any unusually large amount of closing sales either. Instead, Frankfurt has just "added a new dimension to shopping" with a recently opened 8 floor storehouse on Frankfurt's main shopping street Zeil, named in best Germenglish “MyZeil.” I have the best intention to visit the place and to support the German economy with my new credit card (in case Stefan recalls where he put the respective letter from the bank, cough). Instead of global or national hiccups in the financial systems, the topics of the month are apparently the upcoming NATO summit in April in Kehl, and the country is still collectively in shock about the recent school shooting where a nutcase of a teenager killed 15 people. Besides this, Germany has a federal election upcoming this year in September, meaning the election campaigns are slowly starting. As a consequence everybody is criticizing everybody else. Dirk Kurbjuweit (a well-known journalist) just published a book “Angela Merkel: Die Kanzlerin für alle?” (Chancellor for Everybody?) portraying her as too eager to please everybody and having lost direction. And Daniel Friedrich Sturm wrote a book “Wohin geht die SPD?” (Where does the Social Democratic Party go?). That's a good question indeed, maybe somebody should have asked it like 20 years ago. But what's really new about this is that, guess what, the guy has a blog. It's the lawn in front of the CERN Cafeteria! This lovely scene is the backdrop of a picture puzzle, and just one small part of CERNland, a cute interactive site for young kids to explore a bit about CERN, the place, the people working there, the experiments, and the physics background. Thanks for the link, Sabine, it's really great (... OK, the sound is a bit tedious, to my ears at least, but that's what the volume control is good for). Folks, I will be away the next weeks to expand my physical horizon. Expect blogging to be spotty and photo-heavy. PS: Unless our visit counter breaks down again today, we should cross the 1 million mark in a couple of hours. I just came across these interesting survey results on “The State of American Political Ideology, 2009,” which documents the findings of a study by the Progressive Studies Program at the Center for American Progress about political values and beliefs in America. According to their tastefully red-white-blue website decorated with stars and stripes, the Center for American Progress is “a think tank dedicated to improving the lives of Americans through ideas and action.” They have hijacked the words “progress” and “innovation” and explain their “work builds upon progressive ideals put forth by such leaders as Teddy Roosevelt, FDR, JFK, and Martin Luther King,” and “draw from the great social movements of the 20th century—from labor rights and worker safety, to civil rights and women's suffrage” to “translate those values into new ideas and action firmly rooted in the economic and political realities of the 21st century.” That's just so you know what page we are on. The results in the report are based on 1,400 interviews with adults 18 years or older. 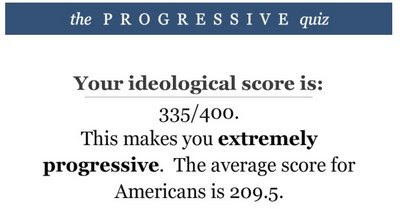 They have put political ideologies on a sliding scale from 0 to 400 with 0 being the most conservative position on the continuum and 400 being the most progressive (according to their report “an innovative categorization of ideology”), and calculated the score from responses to 40 statements about government and society. They find a mean ideological score of 209.5. Interestingly, Americans are apparently most progressive about the role of government and least progressive on cultural and social values. Ideas about economics and international affairs fall in-between. Less surprisingly for what is essentially a two-party system in which every party is trying to adapt to the popular opinion of the day, they find there really is no “far right” or “far left,” but rather “far center-right” and “far center-left.” Do I need to add that a one-dimensional sliding scale with a pre-chosen notion of “progressive” for political, economical as well as social questions doesn't quite accommodate plurality either? “The economic recession is clearly affecting many Americans. A full two-thirds of Americans (67%) report that their family’s income is falling behind the cost of living, with 23% saying their income is staying even and only 6% saying it is going up faster than the cost of living. The belief that family income is failing to keep pace with rising costs is uniformly held across ideological, partisan, race, and income lines. Humor me and leave your score in the comments. I've learned a new expression: Citizen Science. This means that interested people do contribute to a research project, either by collecting data, or by allocating computing time of their PCs to contribute to the analysis of huge sets of raw data - SETI@Home is an example of the latter kind of Citizen Science. Sabine and I talked about this some days ago, and just then, I came across a wonderful example of the former kind of Citizen Science: GLOBE at Night. The idea of this project is to establish a map of "light pollution", the illumination of the night sky caused by artificial light sources on the ground. 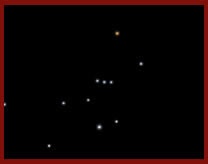 Light pollution is nuisance to everyone who wants to marvel at the stars, and it can be harmful to the biology and ecology of animals in the wild. 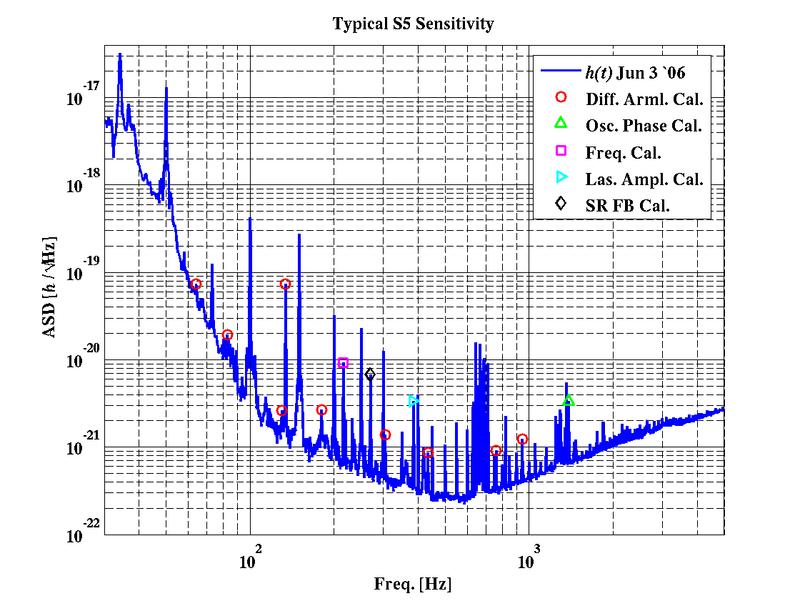 which means visibility of stars corresponding to a Magnitude 3 Chart. But then, this result may have been skewed a bit, as there was a huge natural source of light pollution - the nearly full moon. To avoid this interference by the moonlight, the actual observation period is scheduled towards the next New Moon, between March 16 and March 28. Notice Stars and Stripes and the Golden Gate Bridge in the background. I couldn't quite decide whether it's a joke, but either way, enjoy. The other day I got an email asking for permission to reprint a figure from one of my papers on black hole evaporation for a forthcoming popular science book on “Endings”. Endings have been fashionable for more than a decade now. We all know that we are allegedly approaching The End of Science, The End of History, The End of Faith and have reached The End of Theory, or generally The End of the World as We Know It. The Internet too has an end - been there, done that, what's next? So let me share with you an ancient German proverb: Everything has an end, only the sausage has two*. Or to put it differently, what all these folks proclaim as an end is actually a sign of beginning. Well, I totally disagree with him. This won't be the century of biology, it will be the century of the social sciences or there won't be no next century. Our social systems, political systems, economic systems have reached a level of so high complexity we are constantly faced with emergent phenomena that are beyond our individual understanding. Unfortunately, they are also beyond the understanding of current scientific research. This is pretty much disastrous. We either figure out how to deal with that, or we won't be able to keep up this high level of complexity and tumble back down towards a lower level. As Homer-Dixon masterfully argued out in his book The Ingenuity Gap, we need two types of ingenuity: Technical ingenuity to find new scientific insights and develop applications. But that alone is not sufficient. We also need the social ingenuity to not only implement these insights in a practical and timely manner, but also to foster an environment that is supportive to their development to begin with. It is important to realize these both types of ingenuity are not only necessary for improvement. They are necessary to simply to remain on the level where we are, for we constantly cause new problems that we have to solve. When we fall behind in either category, we will eventually be overrun by problems. Thus, it is about time we finish the scientific revolution, and realize that for sustainable progress we need insights from both the natural AND the social sciences. Year of Science 2009, a website about “How We Know What We Know,” has dedicated the month March to physics and technology, and offers a nice collection of links. Most heartwarming comment we've ever had: “This is great information! Thank you for writing it; now I'm not scared to go to sleep at night. I was afraid the LHC would create black holes that would swallow the earth. Your explanation helped me understand there probably won't be many black holes, and if there are, they'll either shoot off into space or disintegrate. Thank you! --Jonathan, age 8 (typed by his mom),” in reaction to our post Black Holes at the LHC - What can happen? As Tommaso pointed out, we are approaching our 1 millionth visitor! The world was different 20 years ago. German radio reported these days that many teenagers have only a vague idea that back then, Germany was cut in half by a daunting wall. On a lighter note, today's kids may also have difficulties to imagine that there was no WorldWideWeb at that time. But can you believe it? The beginnings of the wonderfully worldwide web go back to the time when the Iron Curtain was still dividing Europe. 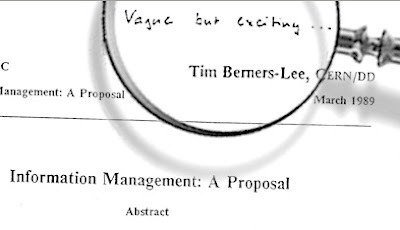 In March 1989, English computer scientist Tim Berners-Lee, then working at CERN, had set himself a bold task. As he had noted, Many of the discussions of the future at CERN and the LHC era end with the question - "Yes, but how will we ever keep track of such a large project?". So, he prepared a proposal to provide an answer to such questions. He introduced the idea of linked information systems and suggested steps we should take to involve ourselves with hypertext now. His boss, Mike Sendall, sympathetically judged these ideas as ‘vague, but exciting’, and Tim Berners-Lee was allowed to continue following his vision. With the help of his colleague Robert Cailliau and a few students, he created the World Wide Web, designed and built the first web browser, and developed and started the first Web server, CERN HTTPd. I recently enriched my vocabulary with expressions like “marginal product of labor,” “price elasticity,” and “isoquants”. The Edgeworth Box. Partial equilibrium. Certeris Paribus. Hutzelpoh. And why is that? Because, well, we have an increasing group of people here at PI sharing an interest in complex systems. For reasons you find in your daily newspaper, these meetings have turned into more or less regular discussions about economic models, and I thought opening a textbook on the matter might be a good idea. See, we'll even have a conference here to save the world economy. I gracefully declined being among the local organizers. Not until I can say “asset-backed securities” and “collateralized debt obligations” without blushing. Thus, one could find last week on the quantitative finance arXiv a paper by Samuel Vazquez on Scale Invariance, Bounded Rationality and Non-Equilibrium Economics, and Time and symmetry in models of economic markets by Lee Smolin. Among other things, Lee discusses the question of gauge symmetries in economic models. For an introduction into the topic, I recommend Eric Weinstein's talk on “Gauge Theory and Inflation,” that you can find at PIRSA: 06050010. A remark on footnote 11 of Lee's paper. Of course there is private health insurance also in Europe. The difference to the USA is that health insurance companies are required to provide a governmentally set minimum of coverage, and it is mandatory to at least have this coverage (which in Germany is referred to as “insurance duty”- Versicherungspflicht.) The USA is besides South Africa the only developed nation without universal health coverage. That having been said, I think what Lee meant is that there are a lot private universities in the USA, the tuition fees are the highest worldwide, and that the health insurance coverage is despite being entirely privatized and not mandatory also more costly and less efficient than in the EU. The consequences of that and the conclusions to draw could fill books, and are hardly appropriately taken care of in that footnote. Craig Hogan, from the University of Chicago, has written several papers predicting a noise that gravitational wave interferometers would be able to detect. This noise would be a signature of Planck-scale uncertainty if a certain type of holography was realized in Nature. 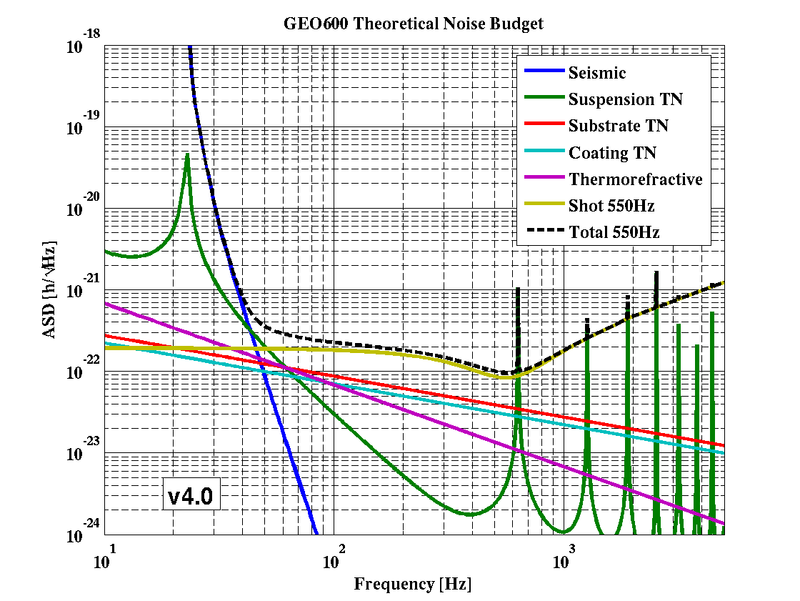 The GEO600 interferometer near Hannover, Germany, would due to its construction details be particularly well suited to detect this noise. Ununderstood noise in experiments is a good prediction to make, especially with large detectors. CERN's Large Electron Positron Collider (the tunnel of which is now reused for the LHC) was sensitive to the tides in Lake Geneva, and GEO600 is sensitive to the tides in the North Sea, and registers even smallest Earthquakes in the South Sea. But still, we are all looking, waiting, hoping for signatures of Quantum Gravity. The idea underlying Hogan's prediction is that our world might have holographic properties, in which case not all three dimensions of our spacetime would encode really independent degrees of freedom. This conjectured property would become noticeable only at very large distances. A device that was able to measure distances in orthogonal directions at long distances and to high precision could be sensitive to this fundamental limit of encoding details, and be subject to a new kind of uncertainty. Gravitational wave interferometers provide exactly such a device. The holography would show up as noise in the detector. Gravitational waves create distortions in our space-time that make themselves felt as tiny changes in lengths which are not the same for all three spatial dimensions. Interferometers lead a laser through a beam-splitter that splits the beam into two orthogonal directions into the “arms” of the interferometer, bounce the beam back on mirrors at the end of these arms, and compare the phases of the light when it comes back. This procedure can detect tiny deviations in the arm lengths which will change the phase shift. A common way to enhance the sensitivity of interferometers are “recycling techniques” that basically artificially increase arm lengths by reflecting the beam several times back and forth. GEO600 would be particularly sensitive to the holographic modification of quantum mechanics Hogan is proposing because the laser is reflected through both arms several times, whereas LIGO, VIRGO and TAMA use so called Fabry-Perot arms that reflect the beam in each arm separately. You find a very useful illustration of this difference between LIGO and GEO600 in Peter Shawhan's presentation, slide 19 and 20. That is how the narrative goes. Stefan and I then looked up Hogan's papers and tried to find out what the underlying model is. Since many points remained unclear to us, I wrote an email to the author who replied almost immediately and patiently answered my questions. He also agreed to be quoted here, which I hope will clarify some points better than Stefan and I could have done. (Eq (7) from 0706.1999), which is then basically the origin of the noise in the interferometer*. Let me start with the question of motivation. The Holographic Principle is the conjecture that all the information about a volume of spacetime is actually encoded on its surface. This conjecture originated from black hole thermodynamics: the entropy of the black hole is proportional to its surface. The Holographic Principle is supported by string theoretical considerations. There is no experimental evidence for it. The Wikipedia entry on the Holographic Principle interestingly refers to the NewScientist article as an experimental test. There is however no derivation of Hogan's modified commutator in any of his papers from the Holographic Principle, there are just many references to papers by Susskind, t'Hooft, Bekenstein, Busso and so on. We are thus actually dealing with an approach that is conjectured to be related to a conjecture. The motivation Hogan provides is from the black hole entropy. He is claiming that his modified version of position uncertainty is necessary for consistency in the black hole entropy and that of its radiation, a conclusion I could not follow (see estimate, comments are welcome). To be fair, this motivation from the black hole entropy does not appear in Hogan's later papers. And despite the missing relation to the usual Holographic Principle one might consider his particular sort of holography and its consequences. But let us have a closer look at the modification of quantum mechanics Hogan is proposing. In his approach, the Planck length plays a special role; combined with the distance L it determines when the new effects would become important. 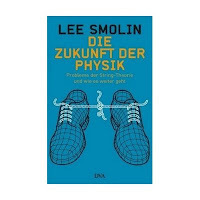 One should be wary of any framework that does such since lengths are not invariant under Lorentz transformations - there is a restframe in which the Earth is of Planck length. Thus, by merely writing down an equation that renders the Planck length special, one creates a problem (see eg my post on The Minimal Length Scale). This is already a serious issue in “Deformed Special Relativity” (DSR) which claims to have found a way to leave the Planck length invariant under a modified sort of Lorentz transformations. Unfortunately, this doesn't work well in position space (see paper) and creates all kinds of unappealing secondary problems, such as the need for a modified addition law of momenta and a missing macroscopic and multi-particle limit. Hogan doesn't mention any of this in his papers. The problems with Hogan's approach are actually worse than that of DSR, as one can see by looking at (1) and (2). In (1) we have two quantities of dimension length on the left side that undergo Lorentz-contraction, while on the right side there is only one, since lp is supposedly invariant. But as becomes particularly clear from (2), there is an additional problem, since L is orthogonal to the x axis - recall that it was a projection down along this axis. Thus, if one performs a boost in direction x, the left side of the inequality (2) can become arbitrarily small, but the right side remains as it is. This equation thus can clearly either not hold in all reference frames or requires some serious modification of Lorentz transformations. The former would imply Lorentz invariance is broken, and this case is very closely studied and tightly constrained by experiment. The latter implies all the problems of DSR and more, since there needs to be taken care of the unusual way orthogonal directions are treated. “In a holographic theory, you can't boost transversely; the wavefront is already moving at c. A boost would change the direction of the wavefront, and the observables. Incidentally, Giovanni Amelino-Camelia considered that gravitational wave interferometers might detect Planck scale noise already in a 2003 paper “Quantum-gravity-motivated Lorentz-symmetry tests with laser interferometers". Without the holographic twist however, he concluded that the necessary sensitivity is out of reach. Hogan is proposing an interesting modification of quantum mechanics that is holographic in the sense that it constrains the precision of measurements connected by lightpaths into directions orthogonal to each other. It is expressed through a modified commutation relation for position operators. The relation to the common Holographic Principle is not entirely clear to me, but it is an approach one can consider nevertheless. It does however necessitate a modification of Special Relativity in order to accommodate the invariance of the Planck length, and an appropriate transformation behavior of orthogonal directions. So far, Hogan's model has not addressed these issues that I believe pose significant challenges as to its consistency. Though I find the possibility that Planck scale physics might already have been detected exciting, I would appreciate an exposition of the framework that clarifies these points. It is certainly a long shot but, you see, if your shot is long enough, you might reach a stable orbit. In reply to my suggestion to blog about it, Hogan wrote “On the blog, you are certainly welcome to post a piece on this --- indeed I hope it will help raise more discussion about it. Up to now I am interacting more with the experimental community, who seem to have a more urgent need to understand it!” Thus, having done my part, your comments are welcome. Update: Thomas Dent points out that unlike what I wrote the GEO600 noise was published in The status of GEO 600, H Grote et al 2008 Class. Quantum Grav. 25 114043, and plots can be found online here and here. It is unclear to my why Hogan's papers do not refer to these publications. * Let me add here that it is not clear to me what L is in the general case, since we are talking about a "distance" between wave-functions whose position is an operator, whereas L is a c-number. If you look at the definition of L in Fig (2) of Hogan's paper you find that the operators x1 and x2 have suddenly lost their operator-hats. I am further not sure how the approach of this paper corresponds to that of later papers. Thus, despite this pictorially making sense, I am missing an operationally well-defined explanation what L is in the general case of this modification of quantum mechanics.